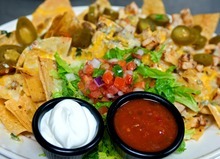 Basket loaded with eight Baja Bites (chicken & cheese in a crispy corn tortilla) stacked with tortilla chips. 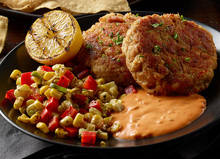 Served with Gringo Dip and salsa. 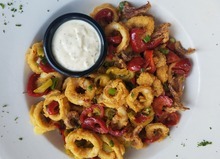 Hand-breaded and fried calamari rings and tentacles tossed with hot cherry peppers. 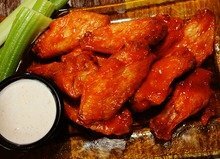 Served with your choice of cocktail sauce, marinara sauce or garlic lemon aioli. Our scratch recipe baked Chicago style with imported Reggiano Parmesan cheese, spinach and artichoke hearts blended in a rich, smooth cream sauce. Served with tortilla chips, salsa and sour cream. 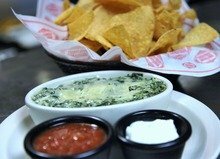 Five Four's famous House recipe, a creamy Pepper Jack cheese dip blended with pico de gallo and the Street's secret spices. Served with salsa and tortilla chips. Crispy shrimp tossed in a creamy spicy sauce. 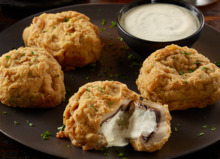 Fresh jumbo mushroom caps filled with herb and garlic cream cheese, battered and fried. Served with creamy horseradish dip. 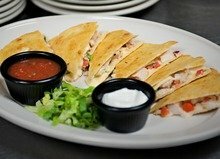 Crispy flour tortillas wrapped around smoked chicken, pico de gallo, black beans, fire-roasted corn and Pepper Jack cheese. 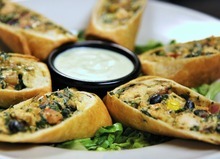 Served with housemade avocado ranch dip. Marinated chicken, Pepper Jack cheese and pico de gallo grilled between tortillas. Served with sour cream and salsa. Hand-breaded chicken tenderloins served with french fries and your choice of dipping sauce. 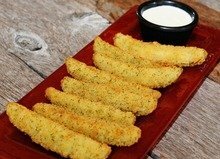 Fried pickle spears with a spice kick. 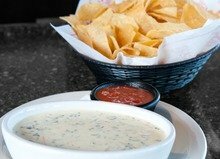 Served with ranch for dippin'. 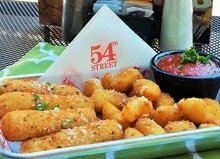 Wisconsin breaded white cheddar bites and Italian breaded mozzarella sticks served with marinara sauce. Skinny fries and waffle fries topped with Cheddar cheese, bacon and scallions. 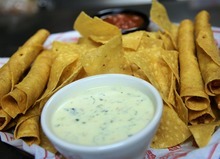 Served with your choice of Gringo Dip or chipotle ranch dip. 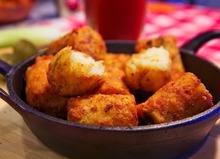 Jumbo tater tots stuffed with bacon, cheddar cheese and chives. 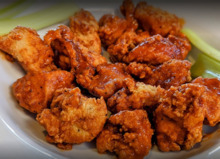 Served with your choice of ranch, cheese sauce or sour cream. Old World, Bavarian pretzels served with housemade cheese sauce for dippin'.